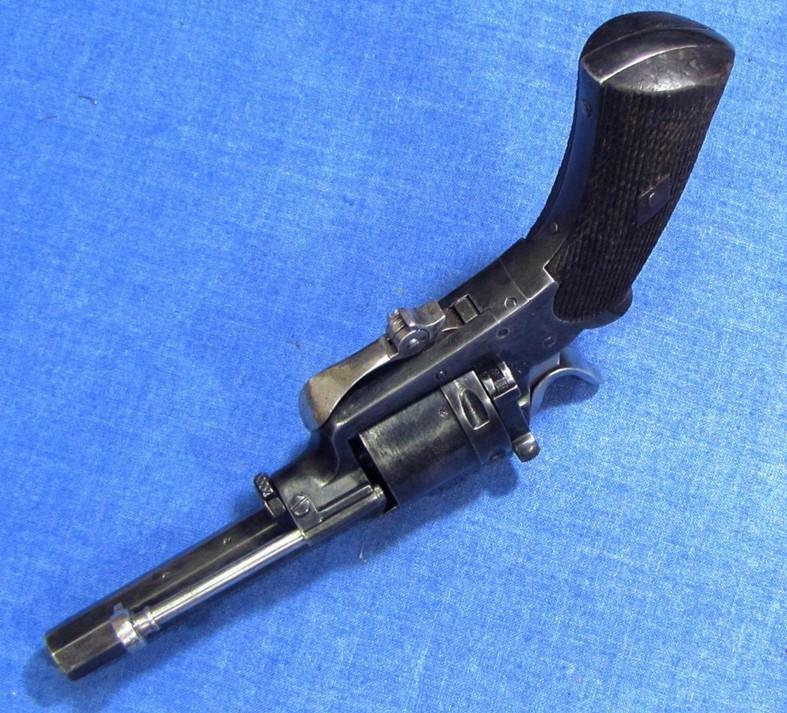 Here is a surprising revolver, it is a classic folding trigger gun made in Great Britain, and it seems to be of the same quality as the Tranter or Webley handguns. What is surprising is that it was made by the C. G. Bonehill company that is known only for its find shotguns. I can find no reference to Bonehill manufacturing small arms. 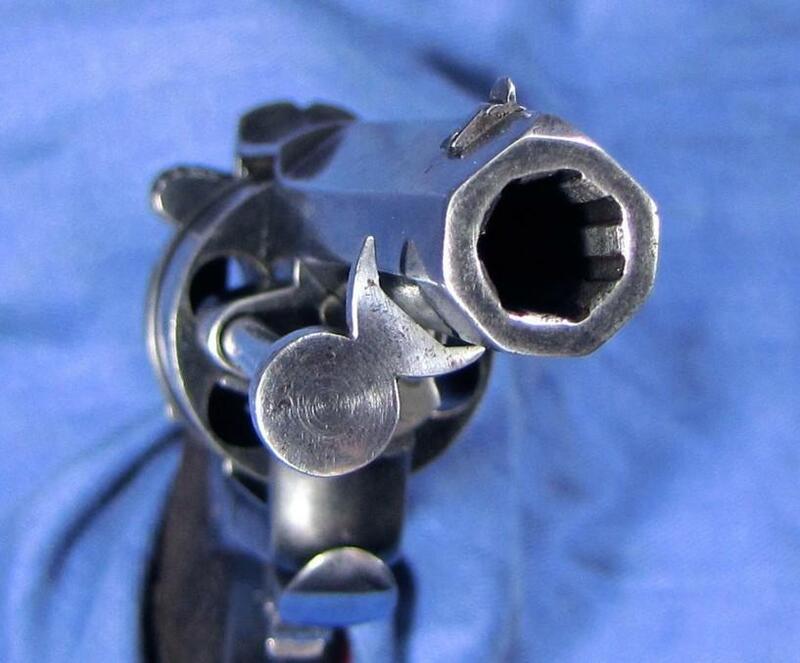 A closed frame revolver with a folding trigger and a lateral loading system, the loading gate is hinged at the bottom and moves out from the action for loading and unloading. It has an integrated extractor rod with a forward side extension that keeps it parallel to the barrel when in use. 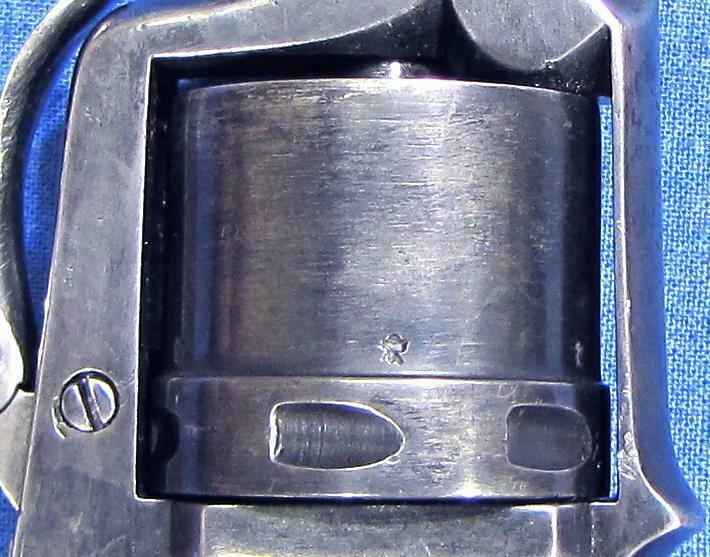 The center post has a spring-loaded catch for securing it within the action while the gun is in use. 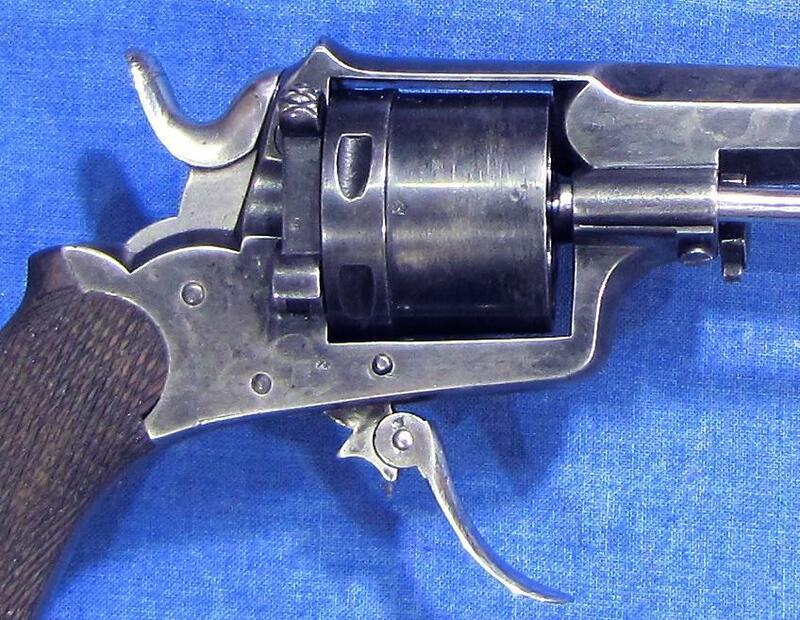 The revolver has an octagonal barrel, and the rifling has 7 grooves with a right hand twist. The original grips are walnut and are almost completely covered with a checkered pattern. 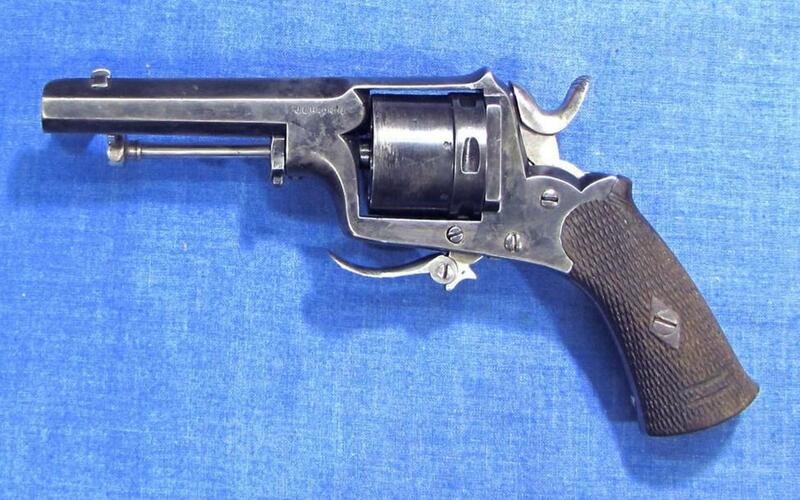 This revolver would have been made sometime after 1870 when the .320 cartridge appeared. 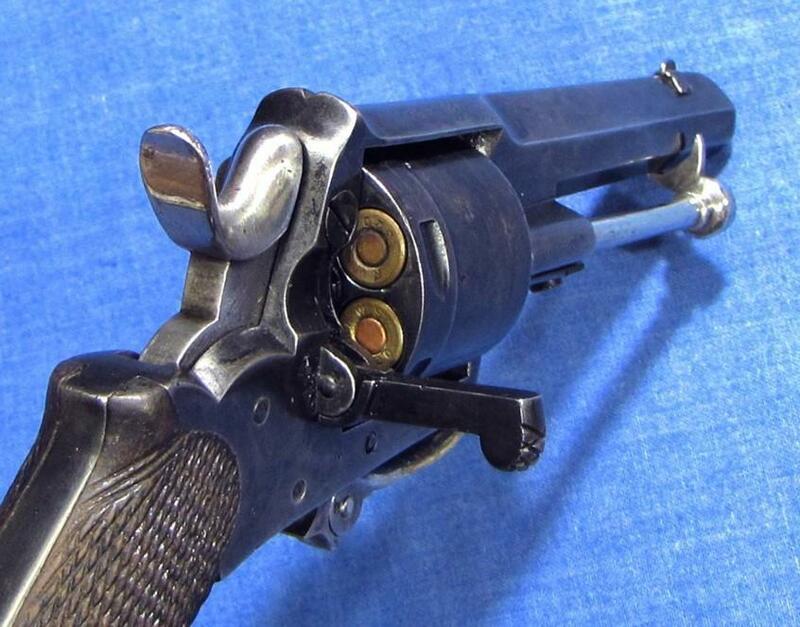 Except for the fixed trajectory of the extractor rod the Bonehill Revolver has some similarities with the Tranter 1868 Revolver and some of the Webley Pocket Revolvers. 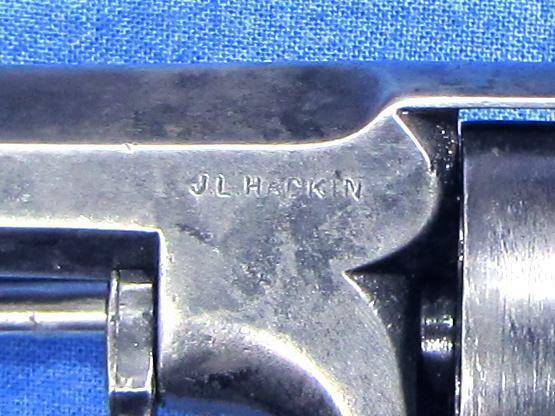 I could find no reference anywhere to J. L. Hackin, the mark on the left of the barrel assembly, which leads me to wonder if that were the owner's name stamped there or perhaps a retailer of small arms. 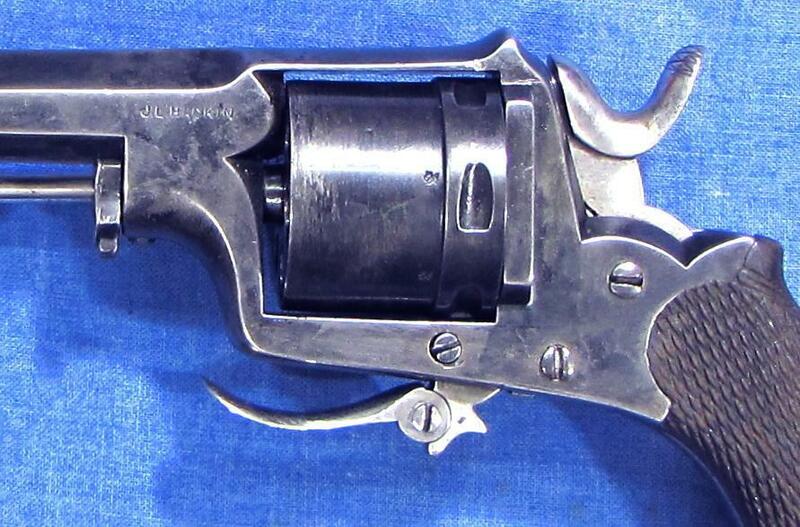 Then, of course, Hackin could well be the manufacturer and Bonehill the one who marketed this revolver. Other Address Morville Street; Price Street? Christopher George Bonehill was born in 1831, son of a manufacturing ironmonger. He was apprenticed from about 1844 to 1851 to a Mr Aston (possibly William Aston & Co). He established his own firm in 1851, but it was only in 1872 that he was recorded at 33 Charlotte Street with a factory in Morville Street. In 1873 he moved the whole business to the Belmont Firearms Works, Belmont Row. It was probably about this time that the firm were appointed contractors to Her Majesty's War Department. C G Bonehill was a Guardian of The Birmingham Proof House. In 1880 he patented a shotgun action and stocks (No.1952). In 1884 he registered four patents, No. 8469 covered barrels, No. 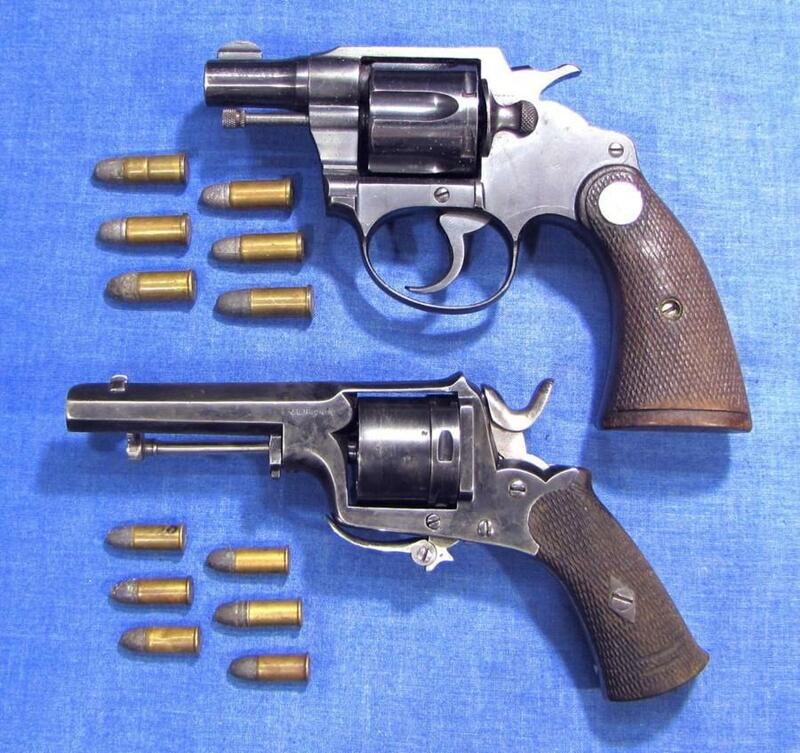 8471 covered a shotgun, and No.12586 taken out jointly with A J Simpson covered a shotgun. In 1877 patent No. 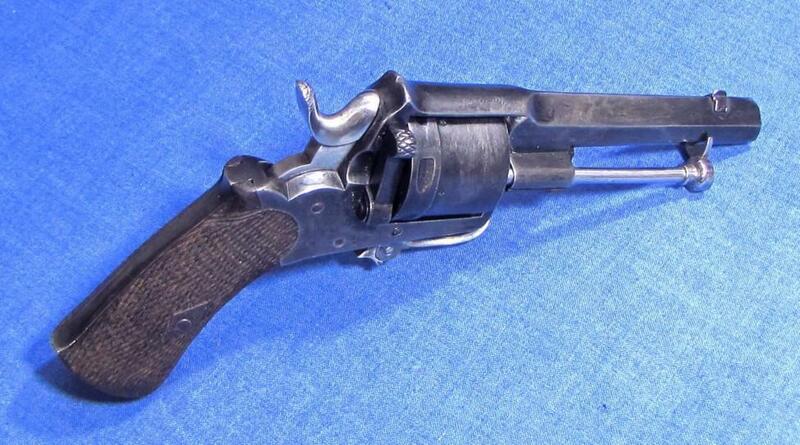 3718 covered a shotgun action and in 1878 patent No. 2323 also covered a shotgun action. 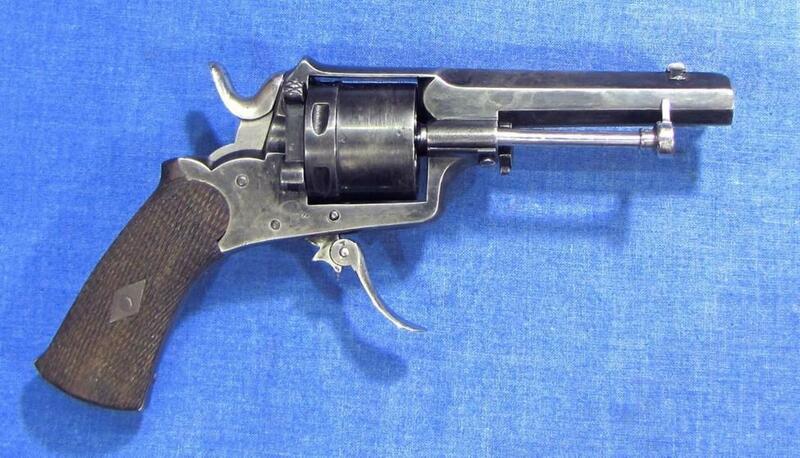 In 1888 No.7823 covered double barrel breech actions and safety catches. At about this time Thomas Naughton worked for the firm, he left in 1887 to join Holloway & Co as manager. In 1895, patent No.12578 with A Tunstall covered a Martini action with a detachable barrel. There may have been another patent for a .22 conversion. Virtually nothing is known about the firm from about 1900 to 1965 when they closed. Presumably, they contributed to the war effort 1914-1918, and presumably they suffered a lack of business in the period 1920-1935. From 1939 to 1965 they would have seen a gradual decline in business. The firm were volume suppliers of sporting guns and rifles for export. They produced ball & shot guns and combination guns, and they made the Britannia air rifle. They were pioneers in the mechanisation of gun manufacture, making the "Belmont Interchangeable" shotguns. From about 1900, C G Bonehill were the main suppliers of rifles to the "Society of Miniature Rifle Clubs". The Society was founded to encourage rifle shooting amongst working class men, and it was largely responsible for establishing smallbore rifle shooting as a sport in England. For this purpose, old .303 Martini-Enfield rifles were re-barrelled to .22 rimfire and sold at very reasonable prices. Charles George Bonehill was a Birmingham gunmaker of wide and varied abilities who, in the 1890s, came up with a revolutionary idea: He would use precision machinery to produce side-by-side shotguns with interchangeable parts. According to C.G., modern machinery could produce bits that were so precise that a gun could be simply assembled, rather than fitted; if a part broke, you could buy a new one and stick it in, rather than sending the gun back to its maker to have a replacement fitted by hand. This idea was not new in the U.S., which had pursued mass production of rifles since the Civil War, and later American boxlock double shotguns were all produced with a minimum of skilled hand labour. But for England, it was revolutionary. Alas, C.G. Bonehill's Interchangeable, as the gun was known, was not a success. It was solid, workmanlike, undeniably cheaper, and by today's standards really quite a good gun, but it lacked the look and the feel of a fine gun, and that was important. So the English trade continued as it always had, with major parts rough-shaped by machine and filed and finished by hand.